Description: -With entire leaves and thin trunk this Dypsis looks best planted in a group, quite easy to grow in the subtropics and would do well as a pot plant further south. 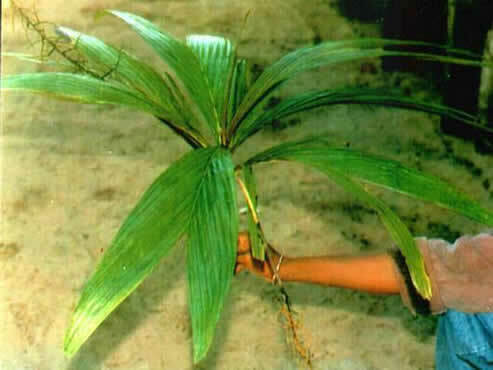 This species is best suited to the tropics but will grow in a well protected area in the subtropics in a frost-free area; it’s a small solitary species only growing to just over 1.5m tall and has a new pinkish emergent leaf, the stem is green like bamboo and very attractive, this species would look good group planted, growing this species in the subtropics is not easy and I would only recommend this species for the collectors or those with experience growing tropical plants. Growing Climate: -Will tolerate temperatures down to 2.C for shot periods but prefers to be in temperatures 15.C to 30.C for the best growth and vigour.